This case is written by Dr. Donika Orlich. She is a staff physician practising in the Greater Toronto Area. She completed her Emergency Medicine training at McMaster University and also completed a fellowship in Simulation and Medical Education. For an excellent review of the management of laryngospasm, click here. A 7-year-old boy arrives via EMS with increased work of breathing. He has a known allergy to peanuts and developed symptoms after eating birthday cake at a party. He has been given 0.15mg IM epinephrine 10 minutes ago by his mother. Current vital are: HR 140, BP 85/60, RR 40, O2 98% on NRB. He has some ongoing wheeze noted by EMS. A 7-year-old male presents with wheeze, rash and increased WOB after eating a birthday cake. He has a known allergy to peanuts. The team must initiate usual anaphylaxis treatment including salbutamol for bronchospasm. The patient will then develop worsened hypotension, requiring the start of an epinephrine infusion. After this the patient will experience increased angioedema, prompting the team to consider intubation. If no paralytic is used for intubation (or if intubation is delayed), the patient will experience laryngospasm. The team will be unable to bag-mask ventilate the patient until they ask for either deeper sedation or a paralytic. If a paralytic is used, the team will be able to successfully intubate the child. This case is written by Dr. Ahmed Taher. He is an Emergency Medicine resident at the University of Toronto and a Masters of Public Health Student at Johns Hopkins University. He developed his appreciation and excitement for simulation while previously employed as a Primary Care Paramedic for York Region EMS. You are working a night shift at your local Emergency Department. You are called STAT to the bedside of a patient in the department who was seen by your colleague earlier and has recently been started on IV ceftriaxone for a pyelonephritis. You recall from handover that this is a 45-year-old previously healthy female patient with a diagnosis of a UTI two weeks ago, who returned after failing treatment and was diagnosed with pyelonephritis today. The nurse tells you she started the IV antibiotics and fluids 20 min ago, and then started to experience respiratory distress and a full body rash. A 45-year-old patient who has already been seen in the ED begins treatment for pyelonephritis with IV antibiotics. Soon after initiated, she develops stridor and respiratory distress, as part of an anaphylactic reaction. The team is called into the room to assess the patient. After standard anaphylaxis treatment is given, the airway is still of concern. Intubation attempts are not successful and the patient will need a surgical airway. This case is written by Dr. Rob Woods. He works in both the adult and pediatric emergency departments in Saskatoon and has been working in New Zealand for the past year. He is the founder and director of the FRCP EM residency program in Saskatchewan. A 3-day-old term male infant is brought to the ED by EMS after being seen at their Family Physician’s office with a low temperature (33.1oC). The child has been feeding poorly for about 12 hours, and has vomited twice. He is lethargic on examination and poorly perfused with intermittent apneas lasting ~ 20 seconds. He requires immediate fluid resuscitation and broad-spectrum antibiotics. His perfusion will improve after IVF boluses, however the apneas will persist and necessitate intubation. 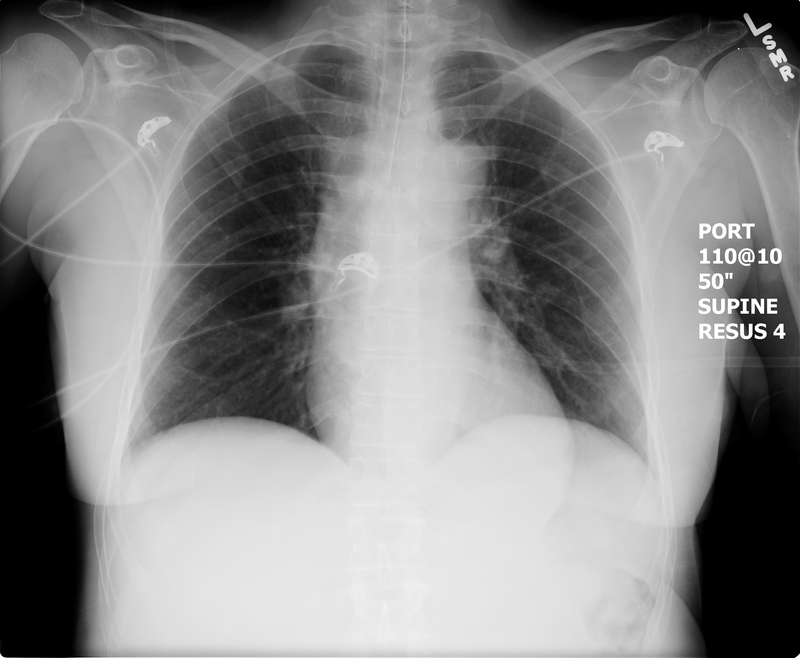 A 46 year old male presents to the ED complaining of shortness of breath and pleuritic chest pain. He broke his ankle a week ago and has been in a cast since. He was just discharged home after operative repair 2 days ago. A 46 year old male with a cast on his left leg from a bad ankle fracture presents to the ED complaining of pleuritic chest pain and shortness of breath. The team will take a history and start workup when the patient will suddenly state he’s “not feeling well” and then arrest. The team will perform ACLS consistent with the PEA algorithm and should consider IV thrombolytics. If IV thrombolytics are administered, the patient will have ROSC. This case is written by Dr. Kyla Caners. She is an emergency physician in Hamilton, Ontario and the Simulation Director of McMaster University’s FRCP-EM program. She is also one of the Editors-in-Chief here at EmSimCases. Patricia is a 50 year old female who presents with epigastric abdominal pain. It’s been persistent for the last 24 hours and radiates through to her back. She has been nauseous all day and has been vomiting so much she “can’t keep anything down.” She was “on a bender” this weekend drinking beer and whiskey. A 50 year-old female who was “on a bender” over the weekend now presents with diffuse abdominal pain and persistent nausea and vomiting. She will have a diffusely tender abdomen, a BP of 80/40, and be tachycardic. The team will need to work through a broad differential diagnosis and should fluid resuscitate aggressively. Once the patient has received 6L of fluid, she will become tachypneic and hypoxic and require intubation. The team will be given a lipase result just prior. This case is written by Dr. Carla Angelski. She has completed both a PEM fellowship at Dalhousie and a MEd in Health Sciences Education. She now works in the Pediatric Emergency Department at the Royal University Hospital in Saskatchewan and is intimately involved in the delivery of high-fidelity simulation at the their sim centre. She is currently working on a curriculum to deliver in-situ simulation for ongoing faculty CME within the division and department. You are working the day shift at a tertiary children’s hospital. A mother brings in her son, James, a four-year old boy with known sickle cell disease (HbSS). She is concerned since he’s had low energy and a cough for two days. Now he’s had a fever since this afternoon. A 4-year-old boy with known sick cell disease presents with two days of cough and a one afternoon of fever. The patient is initially saturating at 88%, looks unwell and is in moderate-severe distress. During the case, the patient’s oxygenation with drop and the emergency team is expected to provide airway support. They will also need to pick appropriate induction agents for intubation. The case will end with ICU admission. During the case, the mother will also be challenging/questioning the team until a team member is delegated to help keep the mother calm.